Grand Master Lu Yaoqin was born in October, 1949 in Fuzhou, Fujian, China. He began his study of martial arts at a very young age with the legendary Ziranmen Grandmaster Wan Laisheng. As a direct disciple for 26 years, he received comprehensive and genuine teachings from Grandmaster Wan. 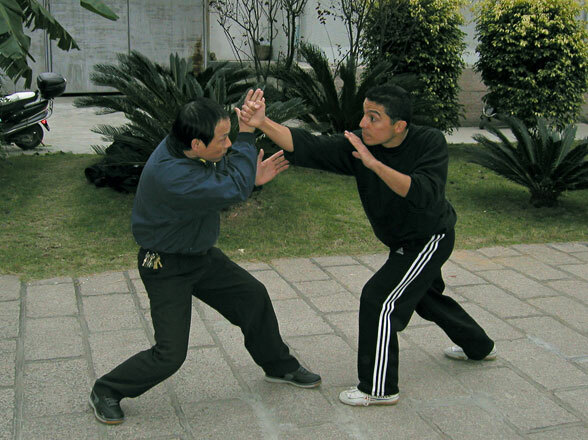 Master Lu is specialized in Ziranmen kungfu, Longevity Qigong and Zhang Sanfeng Taijiquan. Master Lu is also an expert in bone injury treatment, tuina (massage) therapy and qigong therapy. In 1989, Lu represented his aged master, Wan Laisheng, to demonstrate Zhang Sanfeng Taijiquan in the Fujian Province Traditional Fist Competition and received high recognition. The competition was the first of its kind for representatives of all fist styles to demonstrate the most advanced levels of their skills. It was a highly regarded event to all related parties. In October 1989, Master Lu attended the Martial Arts Contest between Mainland China and Taiwan with Grandmaster Wan in Xiamen and exchanged views and discussions about the development of martial arts on both straits. In 1990, Master Lu participated in the Sino-Japanese Martial Arts Demonstration. He demonstrated Liuhe Quan (chi kau lian quan), which thoroughly displayed the charisma of Ziranmen and received widespread acclaim. His demonstration was reported with photographic coverage in various newspapers and magazines in Mainland China and Hong Kong. In 1993, Master Lu led his students to participate in the International Martial Arts Competition and won five gold medals. During the past decades, Master Lu has participated in numerous domestic and overseas martial arts competitions and martial arts cultural exchange activities and received various awards and medals, contributing greatly to the development of martial arts. In 1986, Master Lu founded the Natural Style Martial Arts Academy in Fuzhou, which name was personally inscribed by Grandmaster Wan Laisheng. He also opened classes for bone injury treatment, tuina massage, qigong and dianxue (striking vital points) therapy in joint efforts with the Bone Injury Faculty of the Fujian Chinese Medicine School. Over the years, Master Lu has trained thousands of outstanding talents, laying a strong foundation for the succession of Ziranmen in the generations to come, and fulfilling the final wish of Grandmaster Wan. Many domestic and overseas newspapers and magazines, including Contemporary Dictionary for Chinese Martial Arts, Zhonghua Wushu Magazine, Wulin Magazine, Fujian Daily News, Fuzhou Evening News, Overseas Chinese News of Fujian, Karate Magazine (Japan) and various professional publications, have reported stories about Master Lu.